Shazam! is DC’s most joyful and sweet movie since the days of Christopher Reeve’s Superman, a funny yet earnest coming-of-age story about a boy who learns that, well, with great power comes great responsibility. So obviously, Shazam! doesn’t reinvent the superhero wheel, but it’s an undeniably fun time that left me wanting more big-screen adventures with these charming characters. Where Wonder Woman bore the weight of expectations as the first major modern female superhero film and Aquaman had a load of world-building (and redemption) to do, Shazam! is saddled with no such heavy, external burdens. It’s thus able to be as carefree as a child, to just have fun despite having to inevitably grow up and confront some very adult concerns along the way. Namely, how streetwise orphan Billy Batson must accept responsibility for his behaviour if he’s going to prove truly worthy of the magical gifts bestowed upon him. Ably played as never too obnoxious nor too earnest by Asher Angel, Billy is a good kid at heart who’s largely been mistreated by others. This shoddy treatment speaks to the very important moral at the centre of this particular story (and its villain’s motivations). The key message of Shazam! is that it’s gravely important how adults treat children, whether it’s through remarks or rejections or the choices adults make that impact a child’s emotional development. At the same time, it’s ultimately up to the child to decide whether they turn out kind or unkind. The movie nicely provides a rarely seen positive depiction of foster care, as the most recent family to take Billy in are legitimately good people who truly want the best for him. Of this family – which includes the adorable, but not overly precocious younger sister Darla (Faithe Herman) – the character with the most development is Billy’s foster house roommate Freddie (wonderful scene-stealer Jack Dylan Grazer), whose skills as an in-universe DC fanboy help him fill the mentor role for our fledgling and decidedly un-geeky superhero. 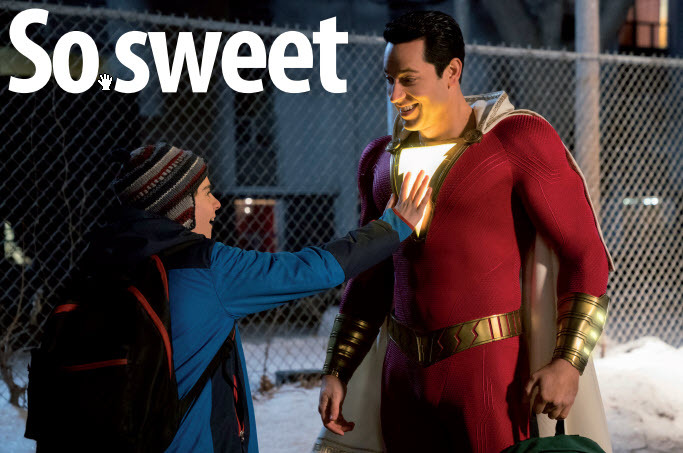 Freddie and Billy/Shazam’s friendship is the heart of this movie and it doesn’t squander their often hilarious interactions as two kids playing with fire taken from the gods. But none of the above would matter if the centre of the movie, its key performer, was weak; thankfully, that isn’t the case here. Zachary Levi is perfect as Shazam. He’s hilarious, heart-warming and completely believable as a 14-year-old boy trapped in a muscle-bound superhero’s body, excelling in both the action scenes as well as in the more vulnerable moments. I could never imagine anyone else in the role after watching Levi here, and his comedic chemistry with Grazer is spot-on. They make for a great buddy act, with each – as real friends or brothers might – complementing the other’s strengths while also schooling them on their weaknesses. This isn’t an action movie per se but a coming-of-age comedy with some action in it. There are some very funny, very knowing superhero moments to be had as Billy/Shazam, documented by Freddie, discovers the range of his newfound powers. These are the scenes where the movie shines brightest, poking fun at all the superhero movie tropes even if nothing much of consequence happens. But once Billy/Shazam realises he can use his powers for more than just cheap tricks, his true hero’s journey begins. Mark Strong wisely underplays his role as the villainous Dr Thaddeus Sivana, and his character has a sympathetic, relatable motivation for his fall from grace, but Sivana’s master plan proves underwhelming. While it’s appreciated that there wasn’t an overtly (and overdone) ‘save the world’ plot in play here, Sivana is basically a villain from a Mummy movie, right down to his monstrous minions, whose retrograde visual effects quality is almost forgivable given the throwback nature of the movie. Sivana serves his purpose as Billy’s foil well enough, but you’ll likely be hard-pressed to recall him when mulling the great comic book movie supervillains. Shazam! is a lot of fun and it further proves how, in the wake of the success of Wonder Woman and Aquaman, DC’s movie future is indeed bright. Now showing in all Bahrain’s cinemas.